Have you been looking for a way to train the ordinary believers under your leadership in effective ways of reaching out to your community? This seminar is for those who desire to learn a winsome and effective way for doing intentional evangelism the way Jesus commanded it. You will learn how to approach people in any situation with a Religious Attitude Questionnaire and poll them about their spirituality – take their spiritual temperature, so to speak. The teaching also will familiarize you with the use of pamphlets for sharing the gospel, following up on new converts, and enveloping them into the local church. For decades now, we have found that people often have a burden, but don’t know how to readily engage seekers outside their Christian bubble” – they have the “want to” but don’t have the “how to.” Be His Witness, Part 1, provides a winsome and proven method for starting spiritual conversations with the folks in your neighborhood or marketplace. The old adage, “Give people a fish, you feed them for a day – Teach people to fish you feed them for a lifetime,” is especially important in the area of evangelism. In order to help ordinary believers restore a lifestyle of evangelism, in some cases, its imperative leaders facilitate their interaction with unbelievers. Through intentional evangelism methods like marketplace outreach and neighborhood canvassing people are able to overcome the initial hurdles of fear and step out in faith into the “classroom of the Holy Spirit.” A delightful by-product of such interactions are believers who are more likely to also engage those neighbors, family and other unsaved loved ones in what Dr. Kelly calls a “holy conversation and invitation” through which God speaks to and through the church to the world. The seminar is available in Html5 streaming in the latest interactive flash file format, pdf files accessible through Adobe Reader and numerous videos formats for either streaming or downloading from Vimeo on your digital device or computer. A companion workbook for making copies or retention of key principles is available in either pdf download or spiral-bound hard copy. It will equip you and others with a biblical perspective on the spiritual realities of our evangelism encounters. It will equip you to equip others in the use of intentional outreach methods for neighborhood canvassing, marketplace outreach, or any other venue, i.e., sanctuary or event evangelism, food pantry, fairs, sports events, or any other public opportunity for church outreach. You can return to the teaching for use in your evangelism outreach, small group or to review portions of it. By learning to share your faith with our Religious Attitude Questionnaire in public venues, your personal outreach encounters will naturally increase. Through the use of the questionnaire and our gospel pamphlets, if you can read – you can share the gospel in a simple and effective way. Our methods are easily duplicatible, so with a brief one or two hour orientation you can mobilize large groups of people to step out in faith to reach their community with the gospel. This curriculum will give you the basics and all the additional details to thoroughly train your evangelism outreach team with a method that has been proven effective over three decades. The materials are available in a number of different digital formats, streaming over the internet, with Adobe Reader, or Vimeo video formats for use on any digital device. People you equip will have the confidence to get over the initial hurdles of fear, and step out in faith into the “classroom of the Holy Spirit” to actually interact with your community in a healthy way that shows them how to listen first to discern respondents openness to the gospel. The first session lays the foundation for understanding what is taking place in your spiritual encounters with unbelievers and seekers. If we wanted to know what was actually taking place in the spiritual realm in these interactions which authority would we turn to regarding these realities: our experiences, our feelings, our intentions, our pastor, or Dr. Kelly? To help you understand what is happening in the spiritual realms, the training focuses on God’s word as the definitive source for insight. The Bible should be the ultimate rule for our faith and practice, so this session looks at a number of biblical passages to help underscore the simple truth that prayer is the key that opens the hearts of humanity to the gospel. You will learn about how we can wage warfare to overcome spiritual blindness, tear down strongholds, stand firm against the devil’s onslaughts of fear, and maintain the appropriate focus on spiritual realities rather than worldly doubts. A biblically informed discussion regarding what is actually involved will help you overcome your fears of reaching out to the lost. You’ll learn why the apostle Paul, one of the greatest evangelists of all time, wrote so much about spiritual warfare and his view of the role of prayer in the area of evangelism. Through understanding what the Scriptures say about your witnessing encounters it will encourage you to step out in confidence that God’s word is true and it will indeed accomplish that which He desires and achieve the purpose for which He sent it. Every session includes provocative and thoughtful discussion questions for you, and your outreach small group if you have one, to consider. Through individual reflection or group discussion of the principles presented, you will be able to apply biblical concepts for outreach to your local community and culture. One of the challenges addressed in this series is how to define evangelism. Confusion regarding what constitutes genuine conversion often results in evangelism methods that do not resonate with the experience of many believers interested in outreach. You will be challenged to consider if your view of conversion is biblically accurate and how you might re-invigorate others toward more effective outreach. Oftentimes, too much of our focus is on a singular point of encounter with the Risen Lord by encouraging folks to say a sinner’s prayer of repentance. But conversion is much more complex than that. You’ll learn about how spiritual journey is an essential model for the conversion process. The key words are journey and process and they involve three phases: 1) Quest, 2) Encounter, and 3) Transformation. Since our beliefs about conversion directly impact our evangelism practices we need to understand the reality that conversion is more of a long-term process than a singular event. This truth challenges us as evangelists to do more than just pray a prayer of repentance, as important as that encounter is, but to also bear the responsibility of incorporating the new believer/seeker into the body of Christ for ongoing life-long transformation/discipleship. You will also learn what Jesus says about evangelism and how his teaching can help you have healthy expectations concerning the harvest. God has given us a number of promises concerning the effectiveness of His word and embracing these promises can give us the holy boldness and sensitivity to the Spirit we need to be effective in bringing others one step closer to Christ. Jesus used the method of inquiry to teach continually in his ministry. There are many biblical examples of his use of questions to spur on spiritual seekers or initiate an evangelistic conversation. Even more significantly, asking people to express their opinions about spiritual matters fits the American psyche like hand in glove. By allowing people to share their opinions on spiritual matters we make it much more likely that they will want to hear what we have to say as well. Once we have earned the right to speak, we can then share the gospel truth with those who are open and willing. Equipping people to poll their community about their church involvement and spirituality facilitates a pro-active engagement with those in our community and provides leadership with keen insight regarding the surrounding community’s spiritual beliefs which is imperative for effective outreach to those outside the faith. In this session you will learn the 13 reasons why questionnaires have proven to be so effective. Questionnaires are simplistic, conform to American thinking, inform respondents of your intent, and are winsome and non-threatening, to name just a few. The teaching comes alive as you see and hear real-life encounters on the streets where respondents go through the questionnaire and provide the answers that are common to such encounters. In addition to seeing the Religious Attitude Questionnaire in actual implementation, data from over 7 years of outreach in Central Florida is also presented. These interactions explode the myth that people are not open to discuss their spirituality or are extremely negative toward Christians and the gospel. This is a lie from the pit of hell, and a major weapon used against believers in their efforts to reach out to the lost in their communities. This session can be used as a precursor to role-playing the use of the questionnaire among those you are training, as they see how the questionnaire works in real time – the good, the bad, and the ugly! You’ll also learn from over three decades of experience in intentional outreach, as Dr. Kelly shares many of his experiences in reaching the lost in the neighborhoods, highways, and biways across the U.S. There real-time experiences will help you and your team overcome the initial hurdles of fear, as you realize how open people are to discuss spiritual matters, when they are approached in the right way with the right attitude. Unfortunately most people’s spirituality is a half mile wide and a quarter inch deep. But when we take the time to ask the right questions and spend some time listening to their opinions they are more willing to hear what the Bible says about God and the spiritual realities of life and death. The use of questionnaires and pamphlets enables us to train others effectively with a method that can be utilized by anyone who can read. It’s amazing how open people are to the gospel when we approach them with the intent of having a genuine dialogue, or holy conversation. Rather than bringing our own agenda to the encounter, by listening to what the Spirit is saying through them, and us, we can anticipate a truly Spirit-led conversation. People are able to overcome much of the fear of witnessing once they have a “track to run on” so to speak. On top of being tentative about what others might say to our witness, we are often not settled or sure about what we would say if given the opportunity. The Our Spiritual Journey Together pamphlet eliminates that anxiety. This session will train you to give a clear scriptural presentation of the gospel and the need for Christ. It will show you how to calmly and naturally lead people to a place of decision regarding their ongoing relationship with Jesus. There are at least 10 reasons why you should use pamphlets to share the gospel; they offer a visual as well as verbal presentation of the gospel, versatility, keep the focus on the gospel, assure the respondent of brevity, and make the Scripture verses readily available, plus many more. You will see how to use both the Our Spiritual Journey Together and Walking with the Lord Jesus Christ pamphlets to more effectively share your faith and especially to train others to be involved in your outreach to others. Tune in to real time conversations around the truths presented in the Our Spiritual Journey Together pamphlet. You’ll hear typical responses and/or questions that arise in discussing the challenging spiritual truths contained in the pamphlet. If the Holy Ghost can use us when we are unprepared, how much more can He use us when we are prepared! 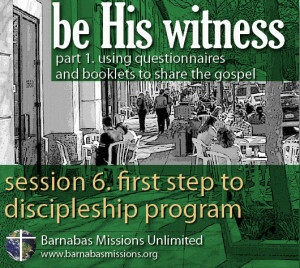 Learning how to share the gospel through the use of this pamphlet and then seeing it play out in real-life on-the-street situations will boost you and your team’s confidence in using this method to bring people to a commitment to Christ. You’ll learn from Dr. Kelly’s over 3 decades of experience in conversations with people who are open to discuss the spiritual realities of God, life and death. This session provides an effective prelude to role-playing situations for you and your team in the use of pamphlets for sharing the gospel with unbelievers. It is critical that people move beyond mere classroom teaching out into the classroom of the Holy Spirit, so they can experience first-hand how the Spirit works through the faithful witness of believers to bring people to a saving knowledge of Christ. Life-long transformation through Christ is more than a one-time commitment, it requires an ongoing relationship with Christ. New believer’s need a basic understanding of the basic spiritual behaviors that signify growth in Christ. If the core spiritual disciplines for new believers were honed-down to just four key aspects of discipleship, what would they be? Most Christians would likely say: prayer, study of God’s word, involvement with a community of faith, and telling others about Christ. What disciplines are most imperative for mature believers, then? The same! So if we are maturing in Christ, we should be able to readily disciple others in the faith likewise. This session covers the use of the Walking With the Lord Jesus Christ pamphlet to share the basics of the Christian journey. Based on Jesus’ statement “I am the Way, the Truth and the Life” (John 14:6), the key aspects of initial discipleship are presented for helping new converts and seekers embrace the “holy habits” that will facilitate their life-long transformation. The content of new believer’s discipleship material is not as critical as the quality time spent in relationship with them. In the same way, their relationship with Jesus is best gauged by how much time they devote in prayer, study of His word, fellowship with other believers, and telling others about Him. The foundational truths shared in this pamphlet will help them develop the kind of devotional life of worship necessary to ensure long-term growth in their spiritual journey. Like the other written materials we use, it gives mentors a track to run on, something they can leave with those that make a commitment, and will form the basis of the spiritual conversations in followup that are necessary to envelop seekers and converts into the life of a local body of believers. You were able to recruit a team of zealous evangelists, completed your first major intentional outreach into your community, and led a number of people to Christ – now what? The session will give you everything you need to establish an ongoing evangelism ministry through followup of new converts, re-commitments, and contacts. The details of how to implement the First Steps to Discipleship Program are covered extensively. It also addresses the use of a Follow-Up Questionnaire to help preserve the harvest by facilitating a second interview with the household of those with whom you have shared the gospel. This can be very helpful when those doing the follow-up are not necessarily those who initially led the respondent to Christ. You will learn step-by-step follow-up procedures to help you develop your organization’s follow-up system and implement the essentials for preserving the harvest God gives you. Such a system is critical for connecting the folks you’ve engaged in outreach to the local body of Christ through an open invitation to fellowship. These contacts should be invited to small groups, Bible studies, worship events, and any and all public events the organization sponsors, especially around Easter, 4th of July, and Christmas. After 30 years of training evangelists, Dr. Kelly has learned some of the basic ins and outs of effective marketplace encounters. You will learn about what do to before you begin, during the witnessing experience, and after sharing the gospel. Because people’s initial experience in ministry shapes their view of ministry for the rest of their life, it’s important we make it as positive as possible. Forewarned is forearmed. Adequate preparation for evangelism outreach is critical in influencing people to return to be a part of your evangelistic endeavors. This lesson will help you overcome many of the obstacles that hinder people from long-term involvement in evangelism outreach. Jesus sent The Twelve and The Seventy-two out into the neighborhoods two by two (Lk. 9 & 10). Pairing new evangelists with the more experienced is a key to effective training. 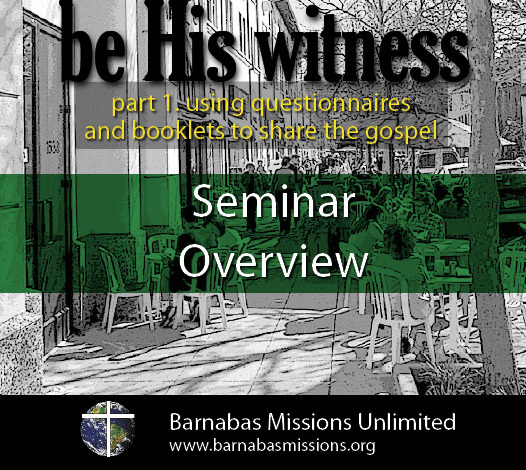 This session covers the most important factors in equipping others to use the Religious Attitude Questionnaire and the gospel pamphlets. It addresses the details of how to train others in the use of these materials to help multiply, rather than merely add to your evangelism ministry. Dr. Kelly shares from years of experiencing in training outreach teams in cities, suburbs, and rural communities all across the U.S. and Latin America. Many believe that the process of conversion has changed significantly – rather than believe and then belong, the reverse is true – people want to belong, and check out the community of faith, before they believe. Common sense dictates that the more opportunities for involvement the higher the likelihood inquirers will get and stay connected. For those who have made a commitment to Christ it begins with face-to-face one-on-one discipleship involving one hour a week to pray with them and answer their questions about their newfound faith in Christ. In addition, each church should have an ongoing new believers’ class, small groups for seekers and new believers, and other nurturing groups. Venues where it is safe to ask any question, which are comprised mostly of new converts or seekers, are critical for connecting people to others of the same gender, age, interests, and similarities to become part of the church family long-term. Small groups are critical to the health of any community of faith. Research shows more than 40% of Americans gather into some sort of small group meeting on a weekly basis and this number is growing. This is a notable demographic within U.S. culture. With so many debilitating influences working against healthy communities today it’s no wonder that many are finding their God-given place as individuals in community in small groups. As society unravels, people are experiencing a crisis of disconnectedness. The church should be the best of all social structures to offer the antidote – genuine New Testament community. In this session you will learn about the purpose of small groups to meet the basic need in people, both within and without the church community, to connect with other human beings. When considering how such small groups might bring people into your community of faith, you should think about what types of small groups you want to form. This session gives you the defining characteristics and examples of relationship, content, task, and need-oriented groups. Of course leadership is essential to help with all these approaches to welcome people to our family. This session will help you to identify and facilitate the F.A.T. people in your congregation (faithful, available and teachable) who can help mentor new converts and seekers. You will also be challenged to think through and discuss some key questions for your assimilation ministry. Who on your church staff or within the congregation is delegated the responsibility of tracking new converts, seekers or new attendees to your church? You will also work through what a small group ministry for new converts or seekers might look like, where it would meet, who would lead it and how would it be structured? The latest research about what makes small groups work most effectively is discussed, along with suggestions for other resources to help you build and lead a small group ministry in the local church setting.